What Are the Health Benefits of the Anthocyanins in Blueberries? What Are 10 Anti-Wrinkle Foods to Eat? Kale is a superfood, rich in vitamins A and K.
4 What Are the Health Benefits of the Anthocyanins in Blueberries? If your diet consists mainly of processed foods, you're likely missing out on a lot of nutrition. Whole foods -- such as fruits, vegetables, lean meats and fish, whole grains, nuts, and seeds -- are far healthier than mac n' cheese and microwave pizza. But which foods are the ultimate? Foods that pack in the most nutrients and have been scientifically proven to fight disease are the healthiest foods in the world and ones that should make a regular appearance on your plate. End your relationship with limp heads of iceberg lettuce and get with kale instead. 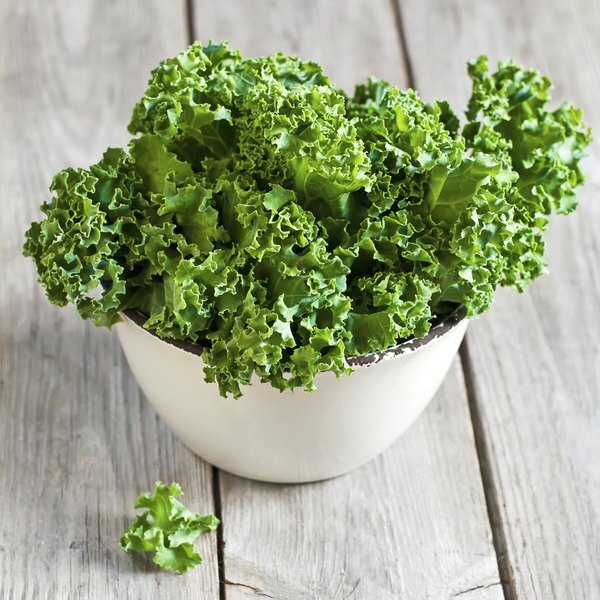 With only 36 calories, 1 cup of kale packs in nearly 3 grams of dietary fiber, more than 100 percent of a woman's daily intake of vitamin A and more than 100 percent of a man's, and well more than 100 percent of a day's vitamin K for all adults. And as part of the family of cruciferous vegetables -- including cabbage, broccoli and kohlrabi -- kale is also rich in a disease-fighting compound called sulfurophane, which may help prevent cancer by ridding the body of potential carcinogens. If you want to lower your risk for heart disease, the No. 1 killer of Americans, put some salmon on your plate. In addition to being a rich source of high-quality protein, salmon is one of the best food sources of the omega-3 fatty acids eicosapentaenoic acid and docosahexaenoic acid. According to the University of Maryland Medical Center website, EPA and DHA lower high cholesterol and blood pressure, both risk factors for heart disease. In fact, according to a study published in JAMA in 2006, eating one to two servings of fatty fish such as salmon each week lowers the risk of coronary death by 36 percent and reduces the risk of total premature mortality by 17 percent. Those little seeds may be a pain to extract, but the effort is worth it. One fruit has almost 5 grams of protein, over 11 grams of fiber and one-quarter of an adult's daily recommended folate intake. But what sets the pomegranate apart is its high levels of disease-fighting antioxidants called flavonoids and polyphenols. The juice of the pomegranate is particularly potent; a study published in the Journal of Agricultural and Food Chemistry in February 2008 found that pomegranate juice had significantly higher antioxidant potency than acai, black cherry, blueberry and cranberry juice; wine; and green, black and white teas. It's no secret that adding more fiber to your diet will improve your health, helping you lose weight, lower your cholesterol and fight heart disease. As far as vegetables go, artichokes are a fiber powerhouse -- with over 10 grams per medium artichoke. What's more, they were the highest-ranking vegetable in terms of their antioxidant capacity in a study published in July 2006 in The American Journal of Clinical Nutrition. They were higher in antioxidants than even dark chocolate, blueberries and red wine. A mainstay on tables in Spain and Italy, olive oil is rich in a particular type of fat called monounsaturated fatty acids, which can lower your risk of heart disease and stroke. According to a review published in Pharmacological Research in January 2007, olive oil has a variety of anti-atherogenic effects, meaning it prevents plaque buildup in the arteries that can lead to several diseases, including coronary heart disease, carotid artery disease, peripheral arterial disease and chronic kidney disease. Authors of the review postulate that the low occurrence of cardiovascular mortality in southern European Mediterranean countries, in spite of the prevalence of risk factors, can be explained in part by those countries' olive oil-rich diets. What Are the Benefits of Sockeye Salmon?